miniOrange provides a ready to use solution for Joomla. This solution ensures that you are ready to roll out secure access to your Joomla site within minutes. miniOrange provides secure access to Joomla for enterprises and full control over access of applications, Single Sign On (SSO) into Joomla with one set of login credentials. Note: If you are looking for the SAML SSO plugin for joomla 2.5.x version, then email us at info@miniorange.com or Contact us. miniOrange SAML SSO Plugin acts as a SAML 2.0 Service Provider which can be configured to establish the trust between the plugin and various SAML 2.0 supported Identity Providers to securely authenticate the user to the Joomla site. We Support plethora of SAML 2.0 Compliant Identity Providers like Shibboleth, SimpleSamlPhp, Okta, ADFS, Salesforce, OpenAM, Centrify, Ping, IBM Tivoli Identity Manager, RSA FIM (Federated Identity Manager), Oracle Identity Manager, miniOrange etc. Use the Attribute Mapping feature to map joomla user profile attributes to your IdP attributes. Use the Role Mapping feature to assign roles in your IdP to your joomla users during auto registration. We provide active support. If you require any Single Sign On application or need any help with installing this plugin, please feel free to email us at info@miniorange.com or Contact us. We have thousands of happy customers using this, click here to have a look. Download the plugin from miniOrange and Install it in Joomla. Configure Single Sign-On Settings in your Idp. 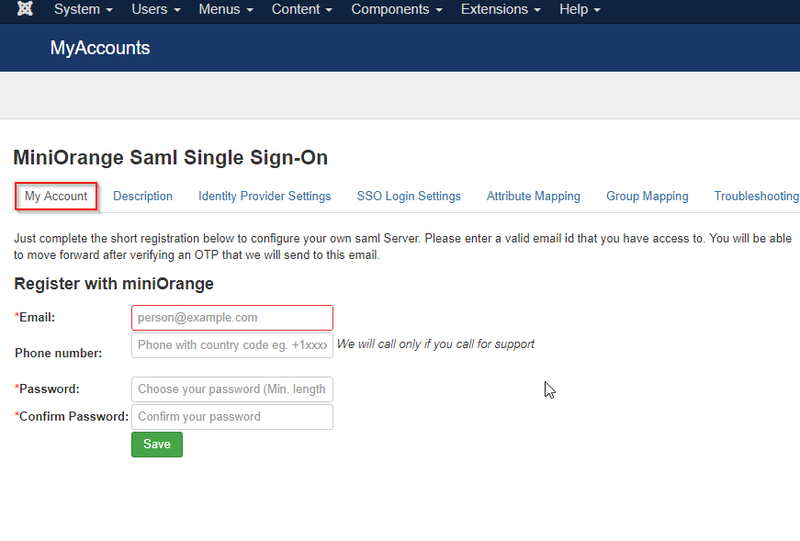 Adding SAML login link in Joomla. In My Account tab, under 'Register with miniOrange', enter your email id and password to create an account. If an account already exists, you will be asked to login into your account. 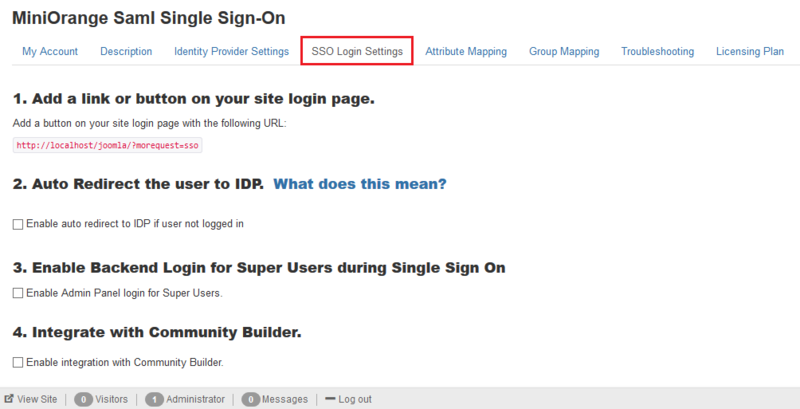 Step 3: Configure Single Sign-On Settings in your Idp. In administrator interface, go to Components > Miniorange Saml Single Sign-On. Go to Components > Miniorange SAML Single Sign-On. Go to Group Mapping Tab if you want to map groups from your idp to Joomla user group when auto creating the user in joomla. Login to your idp with username / password. Once you are authenticated, you will be logged in to joomla site.